University Press Week (#upweek) is in effect. The AAUP website has a gallery of highlights from university presses. 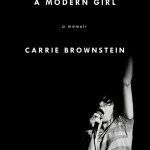 Carrie Brownstein (read our 2005 interview) has a new memoir from Riverhead: Hunger Makes Me a Modern Girl. An excerpt about her mother’s eating disorder is online at The Guardian. Quality isn’t the only factor: read Buzzfeed‘s Ultimate Guide to Getting Published in a Literary Magazine. What are your thoughts on Ayn Rand? Posted in Book Rate and tagged Ayn Rand, Carrie Brownstein, Monday's Margins, University Presses. Bookmark the permalink. Trackbacks are closed, but you can post a comment.